Asking “where is the bathroom” in French is more complicated than it seems. The French have old rules about excusing oneself to go to the restroom. You shouldn’t go in the middle of a meal. And when you need to go, you should be very discreet about it. Here is everything you wanted to know (and more) about using the toilets in France. 1- Don’t Ask For the Bathroom in French To Avoid an Embarrassing Mistake! Many English speakers want to translate “where is the bathroom” literally, hence saying: “où est la salle de bain”. The correct question is: “où sont les toilettes”. Note that the toilet is plural in French. If you are visiting France and need to use the restroom, the easiest thing to do is to step in a coffee shop. Just ask: “est-ce que je peux utiliser vos toilettes s’il vous plaît” (may I use your restroom) with a smile, and it should be no problem. If it’s a big and busyParisian café, just get in and open your eyes for a staircase – toilets are often located one floor down or one floor up. Don’t ask anything and just go. If you are in an extremely touristy area though, toilets may be for patrons only. I suggest you order “un café s’il vous plaît”, then ask “où sont les toilettes?”, use the facilities, pay for your coffee and drink it or not – it’s likely to be a better experience than the public bathroom (where you’ll have to pay anyway – see below). Then get up (you don’t need to say where you are going) and go towards an employee, and ask: “Où sont les toilettes s’il vous plaît”. Easy enough. If you get invited to someone’s house, it’s a bit more complicated. In the best-case scenario, the hostess will volunteer the info when she takes your coat or accompanies you to the living room. She’ll say something like: “Les toilettes sont à gauche” (“The rest room is on the left”) and you should memorize the door. If she doesn’t, then wait for her to get up, follow her (but not into the kitchen, you have no place there in a formal household). Then ask discreetly: “Où est-ce que je peux me rafraîchir?” (“Where can I freshen up?”) or “où est-ce que je peux aller me repoudrer” (where may I powder my nose… a bit old-fashioned though, but still cute). Note the French have all kinds of words to avoid saying “toilettes”: “les petits-coins” (small corners? ), “les cabinets” being one of the most frequent ones. And by the way, French toilets in a private home, specially in an older house, often have no sink. Sorry. Pack some wipes. In a more relaxed setting, you can simply ask “Où sont les toilettes?”, but do it discreetly, not in front of the other guests. And don’t add “Parce que j’ai besoin de faire pipi.” (cause I need to pee)!! In any case, you should plan on going before or after the meal. It’s considered impolite in France to leave the table during a meal, even if lots of people now do it to go smoke outside if the house in non-smoking. If you absolutely need to go during the meal, be as discreet about it as possible. Wait for the end of a course (but not too long, not when they are about to bring the next one), then get up, don’t say anything or say “veuillez m’excuser” and go. 5 – Using the Public Restroom in France – Watch Out!!! 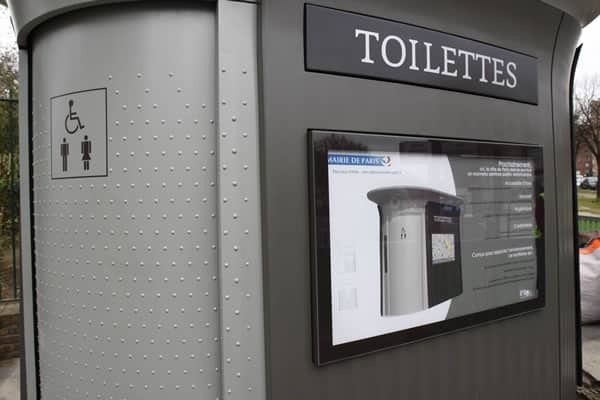 In major cities, you’ll also have what is called “une sanisette”, an automated public restroom (featured on the main picture of this article). You need to pay to get in. It’s usually relatively clean. The instructions are easy enough, it’s not rocket science. However, one word of caution: these toilets “self clean” – meaning the entire room will get cleaned automatically after you exit and lock the door. So don’t try to have your spouse/friend get in without paying his/her toll – s/he’ll get a free shower!! Urinals are extremely common in public toilets in France (as in a highway rest area, a restaurant, a movie theater…). And not discreet at all. Women and kids often have to walk in front of a row of urinals to access the stalls. Or the sinks… How charming. 7 – What is “Une Dame Pipi”? “Une dame pipi” is a very old but still used name for a bathroom attendant. There is another term ” un /une employé(e) sanitaire” but really, nobody uses it. I’ve even asked a “dame pipi” to check, and she said she called herself “une dame pipi”. They are still quite numerous in France, believe it or not. If there is one, you need to leave a tip – sometimes a certain sum is mandatory (such as in “Les Grands Magasins” in Paris where you need to pay to use the bathroom), sometimes it’s at your discretion. Leave one Euro, say “bonjour Madame”, and then when you are done “merci Madame, au revoir Madame” and smile, and you’ll make her day. 8 – What Are These Buttons on the Top of a French Loo ? The French toilets are now equipped with 2 buttons: they will control the amount of water flushed. So press the small one when you went number one, the bigger one for “la grosse commission” (French expression to say poop). 9 – What is a Bidet ? In older houses or elegant hotels (well, now elegant hotels… before very low class hotels…) you had what is called “un bidet”. It’s a very small tub. You sit on it, facing whatever part you want to wash to the water, and can wash your privates (or your feet) quite easily this way. It’s quite practical actually. Unlike in many countries in the world, French toilets are not equipped with a small hand shower. Nor do we have intelligent Japanese like stalls. I guess the loo is still quite classical in France. Many countryside houses in France still have a septic tank. So be considerate and use the trash (“la poubelle”) if you need to flush anything else than toilet paper. You may see when you drive on the French highways cars parked on the safety zone, with a man standing and facing the fields. Yes, he is doing what you think he is doing. Peeing “al fresco” is still very acceptable in France. Consider yourself lucky if you don’t cross paths with a guy relieving himself in the Paris subway or in a parking garage… and should it happen, don’t be alarmed. It’s rather common. Le petit coin, le trône – other words for the toilet, common slang. Les chiottes – slang – some would say vulgar… but very common! 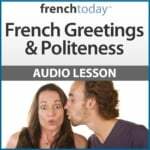 If you enjoyed this lesson, you may also like “how to wash your hair in a French style bathtub” + French bathroom vocabulary. 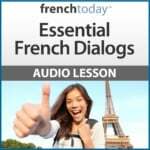 You may also be interested in Period and Menstrual cycle vocabulary in French.